The 2011 James A. Garfield Presidential $1 Coin will be the last of four strikes released by the US Mint in 2011 as part of its Presidential $1 Coin Program. This coin honors the 20th President of the United States with a portrait of him on the obverse. Garfield had served in several positions before being elected to the President. This included an Ohio State Senator, a major general in the United States Army during the American Civil War and a member of the United States House of Representatives. He was elected President and began to serve on March 4, 1881. He promised broad reforms of the civil service, but unfortunately was unable to pursue them as he was assassinated 200 days into his Presidency by a disgruntled Charles Guiteau who had failed to secure a federal post. 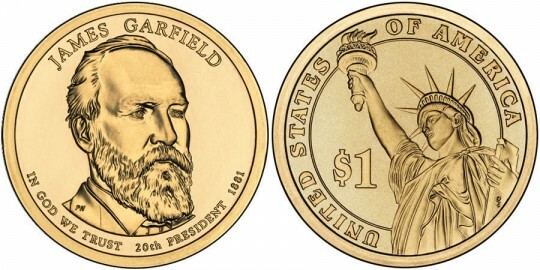 United States Mint Sculptor / Engraver Phebe Hemphill designed the portrait of Garfield that is found on the obverse of the coin. Shown around the image are the inscriptions of "JAMES A. GARFIELD," "20TH PRESIDENT," "1881" and "IN GOD WE TRUST." United States Mint Sculptor / Engraver Don Everhart designed the image of the Statue of Liberty that is found on the reverse of all of the Presidential $1 Coins. Included as well are the inscriptions of "UNTIED STATES OF AMERICA" and "$1."